You are here: Home › How To Make A Blog and a Blog Income › Is Your Website Putting Potential Clients Off? In retail, there is a distinct ‘x factor’ which is tough to define, that means some brands, colors and lettering are appealing, while others leave us cold. Understanding the power of this ‘x factor’ is as important in the online world as it is when you walk through a shopping centre. When we surf, we have a similar reaction to the sites we visit, knowing within seconds whether or not the site is a place we want to stick around and spend time on, or whether it’s not worth looking at, leaving us moving quickly to find a more appealing online space. It’s difficult to say exactly what makes some sites appealing, and others off-putting. What is perhaps easier is to list the things we SHOULDN’T be doing online, if we want to aim for the x factor and get potential clients to spend time with us online. Sometimes when we click on a link in a search engine, we are directed to a page or site which takes a lifetime to load. We pause, waiting for the content to emerge, and begin to get frustrated. Issues such as poor script, weighty images or badly-designed pages can all contribute to a very long load time. By the time your site has finally loaded, your visitor will long since have given up and moved on elsewhere. Check your site to make sure it’s not taking so long to load that you lose your potential customers before they even see it. Use Pingdom Tools to check out your site’s speed. Nothing shouts ‘amateur’ online quite as much as a site which is filled with grammatical errors and poor spelling. The reasoning goes like this – if the site owner can’t even be bothered to check their content to make sure it’s readable, what are the chances that they will bother to deliver a high-quality service or product? Everything you post online needs to be checked before publication, to clear up spelling errors, typos, and confusing language, to make sure that your content online represents you in the best possible light. 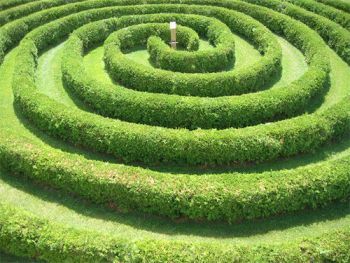 Sometimes, browsing through certain sites can feel a bit like being lost in a maze with no way out. You try to search out the information you need, but find yourself going in circles without ever achieving what you are looking to gain online. The best way to prevent this is to have a clear site map, sound search capability, and a structure that maps out what services you offer, how people can purchase them, and any other information which your customer may be looking for. If it takes too much effort to find information, your visitors will simply give up, go elsewhere, and remember not to return. When we look for things online, we want to get results swiftly. Nothing makes people more irritated than having to wade through reams of irrelevant content before finally getting to the piece of information they need. When you publish content, put it through a quick check before you get it out there – is it applicable to my product/service? Is it answering a specific customer need? If the answer is no, shelve it and turn your attention to something more valuable to your clients. OK, so blogging is arguably the most egocentric medium out there when it comes to people getting on a soapbox and talking about themselves. However, sometimes people can go so far with this, it’s frustrating. If you set up a business selling plants, your customers don’t want to hear about what sort of day you’ve had. They want to read about plants – what to buy, when, how. While a certain amount of personality online is great for relationship building, take care not to flood your site with updates about your personal life, preferences or antics. Instead, keep to the subject you specialize in and leave the personal stuff for a different platform. While these rules are not absolute for every site, they do give us a simple framework for working towards our ‘x factor’ online. By knowing what not to do, we’re in an ideal position to work on developing valuable, positive online content that supports us to shine online. What puts you off re-visiting a website? 6 Responses to Is Your Website Putting Potential Clients Off? Well I hope that you apply something and you beenfit from it. I leave a website if I need to search on every page where the important information is located. Or if you click a link or button, the target page is something totally unexpected. On web shops I have those product page with only one image and almost no information. Non-working functions and error messages are also a good reason to leave a website. All true, Olaf. Sometimes web owners miss the most obvious and they need another pair of eyes to tell them what’s wrong. Wow, Corinne – that is very specific but it would also put me off. Website owners often think they have to write about themselves rather than what they can do for their visitors.